For the last twenty-five years, Sean St. John has built a successful career in the banking and financial industry. He has spent twenty-two of those years at National Bank, where he now serves as executive vice-president and co-head of Fixed Income, Currencies and Commodities. 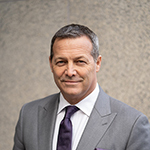 In addition to helping grow the bank’s fixed income group into a top ranked Canadian underwriter, St. John sits on the blockchain committee at National Bank, where he provides strategic guidance on blockchain-related initiatives. Sean St. John sat down recently to talk about the financial realities of businesses working in the tech sector and what potential the landscape of tech products and services has to change our lives in the coming years. Q: How do you think technical investment opportunities have changed the world of finance since you began your career in the 1990s? SEAN ST. JOHN: Credit cards were introduced in the fifties as an alternative to carrying cash, the sixties brought ATMS to replace tellers and branches, the seventies it was electronic stock trading. The eighties saw the rise of bank mainframe computers and more sophisticated systems for data and record-keeping. And then came the nineties, with the Internet and the resultant e-commerce business model. And now, fintech has allowed us to do our banking online—even on our phones—and hardly anyone uses cheques anymore. Economical service, security, safety, convenience. That’s what consumers demand and I think fintech will help us supply all of that. Q: Earlier this year, National Bank was one of the first banks to embrace blockchain debt issuance. Currently, you sit on the blockchain committee at National Bank. What do you think are the potential major changes blockchain-related technologies will have in the financial services industry in years to come? SEAN ST. JOHN: I think blockchain could fundamentally change the financial sector, improving efficiency and making it more resilient. I’m hopeful that blockchain technology will make cyber attacks less likely in the financial services industry and more difficult for one single party to make malicious changes. It’s still in the early stage of development, but blockchain technology has the potential, I think, to streamline all kinds of processes: origination, securities settlement, interest rate payments, and more. Q: Outside of your role at National Bank, you were also on the board of directors for Yroo, a Toronto-based comparison-shopping website, for four years. Do you see that blockchain technology will play a role in streamlining these kinds of online consumer purchases as well? SEAN ST. JOHN: There are plenty of applications for blockchain, some closer to fruition than others. In the future, consumers might be able to pay for goods using cryptocurrency, but digital wallet security needs drastic improvement before that practice is widespread. Blockchain technology could be used in other ways, like proving that users are real and not bots, or authenticating the identity of advertising channels, so that brands don’t pay for ghost sites, and validating the authenticity of news stories. In luxury items, eliminating counterfeit goods is a high priority. But even in less expensive items, consumers want to know the provenance of the products they’re buying. Q: Is there competition among technology companies to get there first in making blockchain technology mainstream? Are we on the cusp of a new era, like the turn of the twentieth century, when there was a scurry to be first as the inventors of the telephone or the airplane? SEAN ST. JOHN: I suppose you could look at it that way. There are many competing blockchain initiatives, and this is an obstacle which needs to be addressed before blockchain technology can be adopted en masse, for international payments, say. In addition, trust must be built, too, by developing a common set of data and process standards. But if you wait for the perfect solution, you might miss an opportunity to shape it. We’re still in a proof-of-concept phase with Quorum—which is our open-source blockchain technology developed by JP Morgan—but scalability will come as the industry matures and develops next-generation blockchain-based payment networks.